Like a flower in blossom when the leaves turn yellow. Wait for the Birth of the Husband has not yet been widely seen in the West, but it did secure an award for the veteran director Zheng Hua at the 2008 Monte-Carlo Television Festival and may perhaps receive the wider exposure that it deserves in the future. The film features excellent color cinematography, with the adroit use of short focal-length compositions. 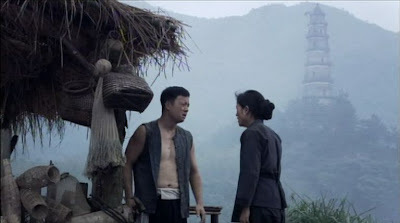 In addition, the acting performances are first-rate, particularly those of Yuan Zhibo (as the mature Runyue) and Dong Ping (as the well-meaning, but conservative, Taohua). The fil m is partly shot inside the confines of a traditional Hakka walled village, whose interesting architecture supplies a picturesque backdrop for the drama that unfolds. Although Wait for the Birth of the Husband could be viewed as simply a dramatic depiction of colorful, but curious, customs of the past, we also expect, given the Chinese restrictions concerning artistic commentary on society, that there may be metaphorical overtones in the film concerning larger themes of present-day concern. The story begins during the 1920s, with ten-year-old Runyue traveling with her peasant father to another village where her future in-laws reside. It is evident that Runyue has no idea what is going on, since she promises her brother upon departing that she will play with him later that day. Upon arrival at the destined Hakka walled village, Runyue learns that she now belongs to another family, almost as a chattel, and must serve as a housemaid to her future mother-in-law, Taohua, who is currently pregnant. Runyue soon meets another, similarly-aged “waiting-for-the-birth-of-the-husband” (this phrase in Chinese is presumably more economically expressed and not quite so awkward) girl, A Ju, who becomes her best friend. It soon becomes quite evident to the Western viewer that women in this society are very much undervalued and underprivileged. The principal value and virtue of a woman is to produce male offspring, and that is the obsession of the pregnant Taohua, who is a recent widow and concerned that her family line will die out without a male heir. She sees her unborn child is the last chance for salvation.. If, on the other hand, the child Taohua delivers turns out to be a girl, Runyue’s fate is quite uncertain. Fortunately for Runyue, Taohua does deliver a boy, named Sihuan, and the first crisis of the story is overcome. As it turns out, however, Runyue’s friend, A Ju, is not so lucky and must wait many years before her “betrothed” enters the world. Time passes, and as Sihuan grows, Runyue looks after him almost like a mother, giving the boy baths and tending to his needs. The action now shifts ahead to when Sihuan is fifteen-years-old – he has reached a mature height, but he is still a child and not yet a man. Even so, Runyue is now twenty-six and impatiently starting to look at her “fiancé” as something more than a boy or a little brother. But without having a real man around to help with the plowing, daily life is hard for Taohua and Runyue, so they are persuaded to hire an almost-deaf war veteran, Chunsheng, to assist with the farming and daily chores. While Sihuan is just a scrawny teenager, Chunsheng is a geneial, strapping, and capable young man more Runyue’s age. Thus the stage is set for the next crisis: the growing attraction between Chunsheng and Runyue. Though both Chunsheng and Runyue are shy and obedient, Taohua fears something might happen and rushes to schedule an early marriage ceremony for Runyue and Sihuan so that the traditional customs can be fulfilled before a scandal arises. The traditional marriage ceremony is performed, but Sihuan, having lived with his “sister” all his life, has difficulty seeing Runyue as an alluring bedmate and is unable to consummate the marriage. Runyue is disappointed, but advised by Taohua to be patient. However, since the Japanese War is now raging, Sihuan abruptly decides to run away to Nanjin g in order to escape being impressed into the army. Not long afterewards the news arrives that Sihuan has apparently passed away due to a fever, which renders Runyue a widow. Taohua is crushed to learn that her last chance for a male heir to her family line is gone, but after awhile she regains herself and comes up with an idea that could bring contentment all around. She goes to a village elder and inquires whether it would be possible for Runyue to wed Chunsheng, and for them to have their first male child designated with her own family name, Wang. This would provide Taohua with the sought-for continuation of her family line, and it would bring happiness to Chunsheng and Runyue. Amazingly, the village elder readily agrees to this arrangement! It seems that though the social rules and customs may be absolutely rigid for women, they can easily be bent by the male village elders whenever they see fit. At this point things look very promising for the long-suffering Runyue and Chunsheng, but there will be a final twist of fate that dashes all their dreams. The ironic closing shots of the film bring us full circle and tie this tale of the past to the present day. Throughout Wait for the Birth of the Husband, there are no malevolent characters. Runyue, A Ju, Taohua, Sihuan, and Chunsheng are all essentially well-meaning and innocent. They don’t complain; they struggle to play by the rules; and they learn to love and care for one another. But they live in a social prison, from which there is no escape. This prison is not material poverty, but the rules and customs imposed upon them by other people. The rules are rigid, unreasonable, and severely prejudicial against women. It is this human institution that is malevolent. In a suffocating society that denies individuality and privacy, Taohua, Runyue, and A Ju are unable to appeal to higher values or to see outside these repressive confines. Chunshe ng, however, is different; he is the outlier, the symbol of authentic good will. His deafness is a metaphor for a person who is partly outside the scope of this restrictive, gossip-driven society. He is less affected by the “inauthentic otherness of the ‘they’”, as a Heideggerian might put it. His responses are not dictated by the rules, but arise from and follow the heart. Unfortunately, neither he nor Runyue is able to overcome the man-made restrictions imposed upon them. And so it is in today’s world, as well. I would love to watch it But I couldn't find it in amazon! ?